Most marine organisms show a dual life stage where settled adults produce dispersing larvae. At the One Tree Island Research station located at the Great Barrier Reef, Australia, we study orientation behavior of the cardinal fish O. doederleini at five adjacent reefs. We genetically assigned up to 60 % of the sampled larvae to their natal reef which ask for orientation behavior. For short distance dispersal (< 3 km), we documented the pronounced importance of olfaction in homing of coral reef fish larvae. Larvae of several species could differentiate between olfactory cues of open-ocean water versus reef water and preferred the olfactory cues in water from their natal reefs. However, a hydrodynamic model of the predominant tidal and ocean currents prevailing at the Capricorn Bunker Reef Group suggests typical dispersal distances of 10-20 km into a north-northwest direction for the first 8 of approximately 16-26 days of dispersal when larvae are still planktonic and can thus not swim against the currents.  For such distances, we provided evidence for a time-compensated sun compass mechanism that can bring fish larvae to the vicinity of their natal reef. 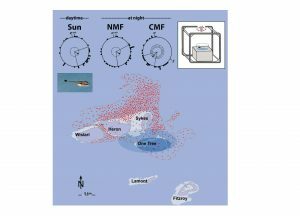 At night, in the absence of any celestial cues, fish showed a spontaneous compass orientation in a natural magnetic field (NMF) as they performed during the day using a sun compass. Settling fish changed the direction accordingly in a magnetic field turned by 120° clockwise (CMF).